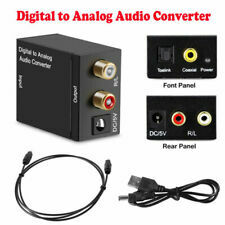 It converts Coaxial or Toslink digital audio signals to analog L/R audio. 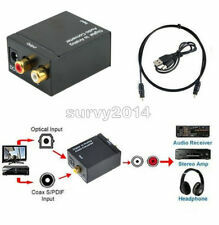 Input Audio: Coaxial or Toslink Digital Audio. So the DAC( Digital to Analog audio converter) will works better, And decode will more stable. RCA male connector. Specifications: Type : RCA Male. 10 x RCA Connector. There are slight difference between the picture and the real item caused by light brightness,hope you can understand. Color : Gold Tone, Silver Tone, Red/Black（Color Sent By Random）. 3 RCA male to 6 RCA female AV cable. 3RCA Male to 6RCA Female AV Cable x 1. Standard RCA "Video, R-Audio-L" (yellow-red-white) connectors. Used to connect RCA audio/video devices such as TV, DVD, etc. PCB panel vertical solder mount in various electric appliances, like Stereo Audio Video, TV, DVD, computer, speaker, etc. One row, 2 position(2 way), RCA female sockets connector on one panel. Type : 2 Position Socket Outlet. Gold-plated RCA male connector amplifier or receiver. Easy to install wire sizes up to 7.0 mm. You may also like. Color: red and black. UGREEN 3.5mm to 2 RCA Audio Auxiliary Stereo Y Splitter Cable. UGREEN 3.5mm(1/8" headphone plug) to 2 RCA(Right/Left) stereo patch cable is ideal for plugging the 3.5mm plug into the headphone jack of your device or computer and the 2 RCA's to the left and right auxiliary inputs on your sound system. Type: RCA/F Splitter Adapter. Pure copper conductor,gold plate for best signal transfer. Male-Female Socket. Used as adapter for audio and video connecting. Material: Copper. 3FT 3 RCA Male to Male Composite Video Stereo Audio Cable Cord Plug Cable. This RCA audio video cable features three color-coded male connectors on each end so you can match them easily to your inputs/outputs. 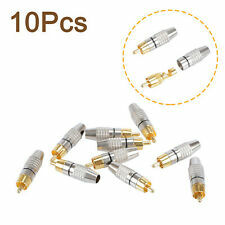 Gold plated connectors are for improved audio/video signal transfer and less signal interference. UGREEN 2RCA Male to 2RCA Male Stereo Audio Cable x1. Connectors: 2RCA Plugs;. RCA Audio Cable. Works great with TV, DVD Player, CD Player, Amplifier, Turntable and Speaker System;. DC Power To RCA Male/ Female Adapter Connector. Connector: RCA Male to DC Power. RCA Female to DC Power. Detail Image. Just screw in. No Solder Necessary. Has a male RCA plug on one end and 2 female RCA jacks on the other end. Connectors: RCA Male to 2 RCA Females. 4 x RCA 1 Male to 2 Female Audio Video Plug Converter. Provide you with the ability to connect RCA cables together in order to extend their length. This RCA Splitter has a Male RCA plug on one end and 2 Female RCA Jack on the other end. 1x RCA Male to 2 RCA Females Audio Y Splitter Plug Adapter. This RCA AV Splitter can be used as adapter for audio and video connecting. 2 2×RCA to 2×RCA audio cable 50cm. Hi-End Monster gold-plated RCA plug. Material: pure copper. External have high-density shock absorber network. oyaide 4.7% silver soldering. Pure DIY handmade. Connector A - 3RCA Male Straight. Connector B - 3RCA Male Angled. Premium Gold Plated 90 Degree Right Angle RCA Audio/Video Cable. 1pc RCA Cable. Shielded to prevent EMI/RFI interference. Designed to connect RCA audioideo devices. 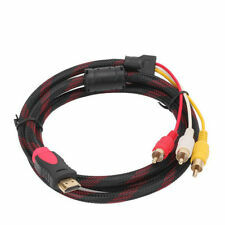 1 x 1m Twin 2 x Phono RCA Stereo Audio Cable. Usually used to connect hi-fi separates together or DVD player to hi-fi. The phono connectors on any audio hardware give left and right channel audio, and can connect to anything with matching connectors.